Our work on host-parasite interactions fits within our more general interest in how anthropogenic environmental change and human management affect species interactions. 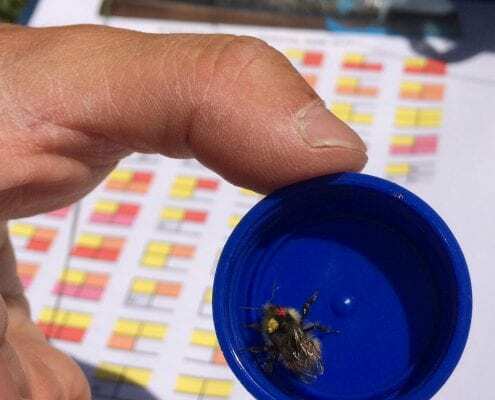 With funding from USDA and NIH, we have focused on how management of honey bees affects host-parasite coevolution and in particular the evolution of virulence, in the context of spatial structuring of transmission. This is the first work to use population genetic approaches to understand patterns of gene flow and potentially transmission in Varroa mites, the single largest cause of honey bee colony loss worldwide. In collaboration with Jaap De Roode (Emory), Keith Delaplane (UGA) and Mike Boots (Berkeley), and with current funding from NIH and past funding from the USDA, we are investigating the role of spatial transmission structure on the evolution of virulence in the honey bee – Varroa mite system, using both empirical experiments and modeling.